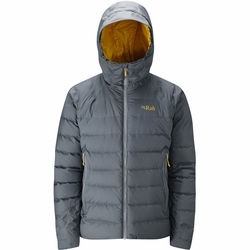 Rab Valiance Jacket. The ultimate warm and waterproof down jacket. However wild the weather gets, our Valiance Jacket is welcome sanctuary from the storm. Ice-blasted, rain-lashed and weather-beaten, you can't control the weather. However, with a durable, waterproof Pertex outer and our innovative bonded box wall technology, in the Valiance, you can be sure of protection beneath even the darkest mountain skies. Filled with the highest quality 800 fill power ethically sourced hydrophobic down this jacket is perfect for cold and changeable weather. With an insulated helmet compatible hood, YKK AquaGaurd Zips throughout and adjustable cuffs and hem, the Valiance has all the features you need to take on winter.